Phil Plait is an accomplished astronomer, author and blogger. 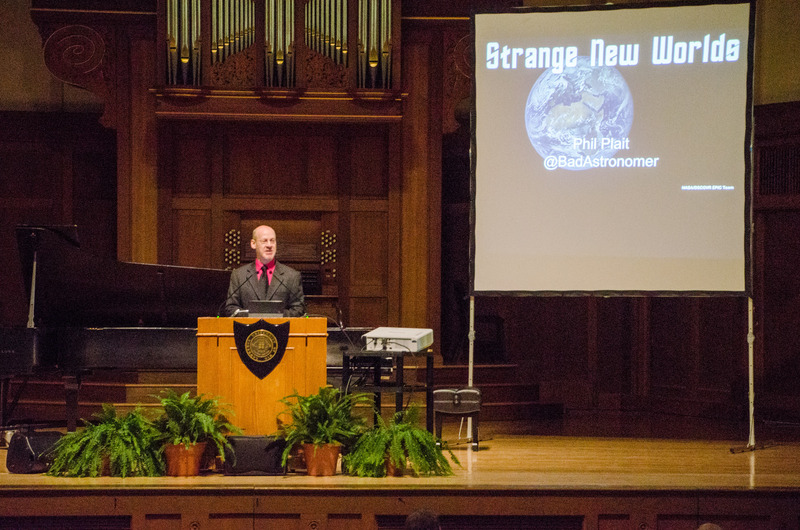 Phil Plait—author, astronomer, skeptic and blogger—was the third speaker for the 2018-19 Convocation Series. Plait’s speech, “Strange New Worlds: Is Earth Special?”, was held in Memorial Chapel at 11:10 a.m. on Thursday, Jan. 17. As has become custom, in President Mark Burstein’s welcome at the beginning of the event, he read a land acknowledgement for Lawrence’s Appleton and Door County campuses. This land acknowledgment can now be found on the Lawrence website in the “About” section. Following President Burstein’s welcome, sophomore Hung Nguyen and junior Ji Yang performed “Mercury, The Winged Messenger” from “The Planets” on pianos. After the performance, Associate Professor of Physics and Chair of the Physics Department Megan Picket introduced Plait. The friendship between Plait and Picket allowed the introduction to include jokes as well as the typical mentions of awards and experiences. Picket made a point to mention Plait’s unique humor, often showcased in his writing. Plait began his speech by setting the stage with the line: “as twilight falls in the Chapel.” After introducing his humor, Plait began to mention what excites him most about science. He is both passionate for what science is and what it is not, and he spoke of his favorite research about planets around other stars. Plait’s research revolves around the question : “Is Earth special?” This is exceptionally interesting to him, as he admits that during his years in graduate school, there was not a single planet outside of our solar system discovered yet. Throughout his speech, Plait returned to the question of Earth’s possibly special nature. Often the answer was along the lines of, “Maybe, but…” These unclear and sometimes changing answers are due to the wrong question being asked, according to Plait. The answer shifts based on the question being asked, for the question of whether Earth is special is too broad. According to Plait, there needs to be some context. In what regard could Earth be special? Plait points out that Earth is definitely special in that it is the only planet that is known to have water on the surface. Because we know life needs water, this points to the idea of Earth being quite special indeed. Through Plait’s continuous questioning, he explained the Habitable Zone, also known as the Goldilocks Zone, to the audience. He also introduced the concepts of transit theory, Doppler shift and reflex velocity. Despite these possibly foreign terms, Plait addressed the definitions and effects of each term. Plait continued to discuss Earth-like planets and “super Earths” and compare them to the nature of our Earth. According to Plait, there could be billions of Earth-like planets in our galaxy alone. In that regard, Earth is not particularly special. Despite the ever-changing answer to Plait’s question of whether Earth is special, he concluded his speech a bit sentimentally. “It is our home. Is Earth special? Yeah, I think it is.” Following Plait’s speech, there was an informal question and answer session held in the Memorial Chapel. The fourth Convocation in the 2018-19 Series will be delivered by Matika Wilbur. Wilbur is the Project 562 director and photographer. She will be delivering her speech “Changing the Way We See Native America” on Thursday, Apr. 11, 2019, at 11:10 a.m. in Memorial Chapel.